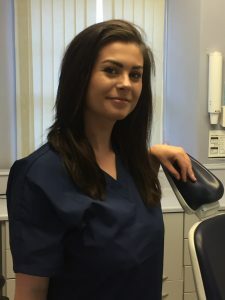 Jodie joined us in 2018 as a trainee dental nurse and is working towards her NEBDN Dental Nursing qualification. Jodie’s previous experience working in a busy medical centre has helped with her transition to working with our patients and she has very quickly become a valuable member of our busy team supporting our dentists. In her spare time Jodie likes to spend time with her family and socialise with friends. She also enjoys listening to music and judging local dance competitions.